"Step back in time on this 4-day Classical Greece tour from Athens, seeing all the top attractions that date back to this fascinating era. With overnight accommodation included and an expert guide to accompany you, the tour highlights the country's most intriguing archeological sites four of which are listed as UNESCO World Heritage Sites. Explore Epidaurus, Mycenae, Olympia and Delphi, and visit 11th-century monasteries perched on the rock towers of Meteora. Leave Athens behind and head west to Corinth Canal - your first stop of the day! Linking the Gulf of Corinth with the Saronic Gulf, the canal is narrow, and the ancient ships that once passed through have been replaced with bungee jumpers. After exploring, continue on to Mycenae for a walking tour. Learn about the development of Classical Greek culture as you walk through this fascinating archeological site. After lunch (own expense) in Mycenae, travel to Epidaurus for a tour of its archaeological site, stopping to see the UNESCO World Heritage-listed Sanctuary of Asklepios (shrine to the Greek god of medicine). Contine to Nauplia - a pretty seaport town - where you'll have the evening to spend at leisure. After breakfast, set off with your guide by luxury coach, and visit the Archeological Site of Olympia. Home to the Atlis (Sanctuary of the Gods), the site was a mecca for ancient Greeks who came here to worship Zeus. See incredible ruins like the Stadium of Olympia, where the country's ancient Olympic Games were held. In the afternoon, board your coach for a scenic drive to Antirion, passing the towns of Patras. Cross over the Rion-Antirion Bridge - considered a landmark of 21st-century Greece - and then sightsee independently in Antirion and the nearby town of Nafpaktos. Finish your day with a relaxing meal at your hotel in Delphi. 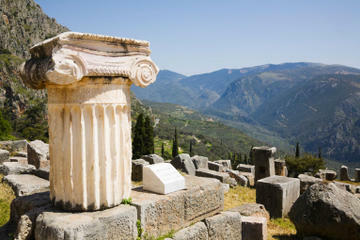 Rise early and meet your guide to explore Delphi - one of the most important archeological digs in Europe. As you walk around this stunning UNESCO World Heritage Site with your guide, see monuments like the Sanctuary of Athena. Head inside the Delphi Archeological Museum and encounter numerous artifacts and relics that date back to 15th century BC. Watch out for the Charioteer of Delphi and the intriguing Sphinx of Naxos. After spending most of your day in Delphi, head to Kalambakka by coach, traveling through the eye-catching towns of Amphissa, Lamia and Trikala. Enjoy dinner at your hotel and then relax at leisure. Leave your hotel to visit the rock towers of Meteora - incredible sandstone peaks topped with 11th-century monasteries. With your guide, make your way up the walking trails to visit these monasteries, enjoying breathtaking panoramic views from the top. After spending the morning exploring Meteora, head back to Athens by coach, stopping in the town of Thermopylae and at Kamena Voural hot springs. Arrive back in Athens at approximately 7pm. Special Offer - Book and travel by March 31, 2015 and you will enjoy 4 Star Accommodation for the price of 3 Star Accommodation - Book Now!